The Taipei Economic and Cultural Office brings a small program of Taiwanese films to the Shang Cineplex. 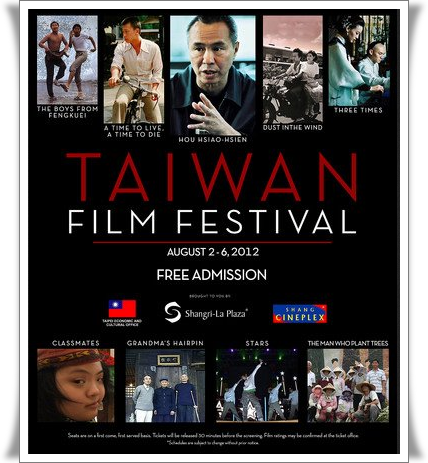 Running from August 2 to 6, 2012, the third Taiwan Film Festival pays tribute to one of Taiwan’s greatest directors, as well offers a selection of contemporary documentaries that chronicle the life of modern Taiwan. Admission is free. Half of the festival’s program is given over to films by director Hou Hsiao-Hsien. Hou is easily one of Taiwan’s most accomplished directors. His career spans decades, and he had won dozens of awards from all over the world. And yet his work tends to go largely unseen outside of the festival circuit. These films serves as a fine introduction to the director’s work. A Time to Live, A Time to Die (Tong Nian Wang Shi, 1985). This film tells the story of a young boy whose family moves from Mainland China to Taiwan in 1947. Based loosely on Hou’s own experiences as a young man, this coming-of-age film explores the rift that occurs between the boy and his family as he loses touch with his cultural heritage. The film can be challenging, requiring patience from the viewer as it meanders through the mundane lives of its characters. But there are moments of such immense beauty and sadness in it that one can’t help but be moved. The Boys from Fangkuei (Fēngguì lái de rén, 1983) comes a little bit before Hou found his directorial voice, but one can already see the filmmaker putting together the pieces of what would become his style. This is also a coming-of-age picture, following a group of delinquents from a small seaside town. They spend their time shooting pool, getting drunk and picking up girls, before moving to the city Kaohsiung to look for work. And there they discover that they don’t know as much about the world as they thought. The Boys from Fangkuei isn’t as polished as the rest of Hou’s films, but it can be surprisingly moving. It can be surprisingly tender, the story tinged with nostalgia and a quiet sense of humor. Dust in the Wind (Liàn liàn fēng chén, 1986) touches on the same themes as The Boys of Fengkuei, the film also depicting the plight of small town Taiwanese kids who arrive at the big city. This one follows a teenage couple as they move from their small village and try to make in Taipei. They are in love, but their love struggles to survive their economic and political reality. But where The Boys from Fangkuei feels a bit like a cautionary tale, this film plays out as a real tragedy, finding real anguish in the character’s simple acceptance that life continues to go on. The festival is also screening Three Times (Zuì hǎo de shí guāng, 2005), which was shown in last year’s program. If you missed it last year, you really ought to see it now. It’s a remarkable film that tells stories of romance set against conflict, with the same two actors portraying the lovers in each story. Not every segment works, but the film is able to build to a depth of emotion that can be quite moving. The other half of the program is composed of documentaries. Of the four, Grandma’s Hairpin (Hsiao Chu-Chen, 2000, Yin Zan Zi) might be the one most worth seeing. The director tells the story of her father, who was one of the soldiers that had retreated to Taiwan back in 1949 following a defeat at the hands of the communists in 1949. Back then, the soldiers believed that they would soon be able to return to China, but that actually didn’t happen until 1987. Some of the soldiers attempt to rebuild a life in a China that no longer feels like home. It’s incredibly powerful stuff, the film digging into the very idea of Taiwan as a nation by examining the lives of the people who had fought for it. The Man Who Plants Trees (Zhong Shu De Nan Ren, 2008, Lin Yu-Hsien) tells the remarkable tale of Lu Ming-Shih, a man who sets out to plant trees all along the Tropic of Cancer. The documentary follows him as he attempts to plant trees on the Chianan plain, finding resistance along the way. This is the story of a dreamer, a man so in love with nature that he dedicates his life to it. Classmates (2009, Cheng Yao-Ting) follows four young people who were graduates of a special inclusive school program, which integrated special needs students with regular students. The film looks into their lives as they approach the responsibilities of adulthood, while also documenting the development and the current state of the inclusive program that would become so important in their lives. And finally, Stars (Xing Guang Chuan Qi, 2008, Hsu Ming-Chun) is a documentary on Taiwanese reality singing competition Million Star. The film follows a few of the contestants from the second season of the show, looking in their lives and following them as they climb the ladder of stardom. The film presents the show as a magical place where dreams come true, which is a little suspect. Still, the contestants are real people, and seeing them live out their pop star fantasies can be somewhat compelling.